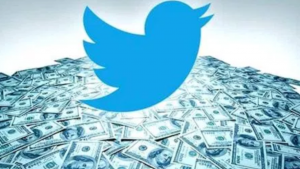 10 Top ways to make money online using Twitter..
Social media platforms have become money making opportunities. Twitter is among the social media platforms that offers these opportunities. There are a variety of options to explore when aiming to generate income from Twitter, the top 10 ways are listed below. You may have seen a few of your favorite social media influencers use a few of these techniques, but don’t limit yourself – try a few of them on your personal account! Sponsored tweets are a good option for those of you that have thousands of followers, or are in the process of landing into that following range. These sponsored tweets are used by brands to utilize popular Twitter “influencers” to advertise their products. These brands pay for each advertisement and your job is to simply create a tweet based on guidelines set by the brand. I’m sure you’ve seen affiliate marketing as an option for making money online. In fact, I have an article about my #1 recommendation for an affiliate marketing program. But these opportunities are not limited – they expand to social media platforms like Twitter! Affiliate marketing offers a percentage of sales based on the purchases made through the link provided by the company’s affiliate program. If you have an organization that needs funding, crowdsourcing can be a great way to present your organization to your Twitter following. Crowdsourcing will allow your followers to contribute to the organization. Selling products on Twitter also relates to sponsored tweets. There are millions of product options available online – why not promote them? If you offer products, even better, promote those too! Use your 140 characters to tweet about your use of a product and adding a link (payment would be based on a prior agreement with the company). Have you ever heard the saying, “Sometimes the best way to get something is to ask for it?” Ask for the funding that you want. Sometimes it’s as simple as a tweet requesting money to your PayPal or sharing your code for your CashApp, Venmo, Patreon, or GoFundMe account. It’s easier to have followers interested in sending funding when it is for something that benefits the community as a whole – so consider your business, organization, or other cause as the focus of the funding. If you offer a service, take advantage of Twitter’s platform to advertise it! Instead of, or in addition to, having sponsored tweets, advertise your services in your tweet. You can add a link to your website and encourage your followers to retweet it so that you expand the number of people that have a chance to click your link. YouTube video links can be shared with anyone, anywhere. Start sharing your YouTube link on Twitter to maneuver your Twitter traffic towards your monetized YouTube videos. This will increase your YouTube subscriptions and views, which in turn will increase your money. Twitter offers a small number of characters, but enough to share a referral link with a few clever words to convince your followers to click it. If you’re a consistent Airbnb user, share your referral link to get a few bucks added towards your next trip. Or for any other site that you use often, share your next experience with that site through a picture or few clever words and referral link. 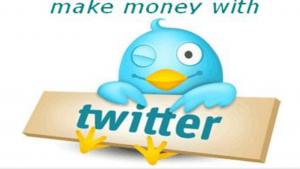 Why not make money online using Twitter by advertising ways to make money on Twitter? As confusing as that sounds, allow me to explain. The same things that sparked your interest on how to earn money on Twitter has affected others (many of whom may already be following you). Use this sparked interest to your advantage by tweeting about a course or blog that you’ve created about ways to make money on Twitter. This will direct your followers to your website so that they can sign up and PAY for the course to receive your expertise. The reality is that when you have a large twitter following, opportunities come to you. Brands pitch their products and services to you, in hopes that you will share it with others – and they pay you for it. Make sure that your followers are active, which means you should avoid buying followers. None of the other techniques will work if your followers are not actively interacting with your account. Observe your favorite social media influencers and take note of their money-making techniques on Twitter. Establish trust with your followers so that they trust your opinions. Are you looking for legit work online, besides working with Twitter? Click here, to read my #1 recommendation. 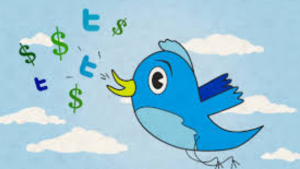 Do you have something to say about your experience with earning income through Twitter? Maybe something to add about your success or failures with a few of these techniques? If you do, please take the time and leave your comment at the bottom. I would love to hear it! Thanks for reading my post, and good luck with your success!